The subject matter of Abyaat no. 2 and 3 is same. 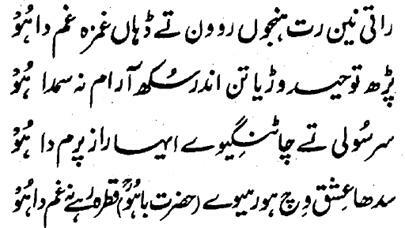 Hazrat Sultan Bahu Rahmatu-Allahe Ta-aala Alaihe has said in the time of Demand that that 'his eyes shed tears of blood instead of water in the Curiosity and Muhabbat for the Real beloved and he remains aggrieved with the grief of the Friend. Since the time, the Noor of Tauheed has entered our body through the Visualization of the Name-Allah-the-Essence (Ism-e-Allah-Zaat) , we have no peace and rest. The Secret and consequence of Ishq is this that the Aashiq, as if, is hanged on the crusade. At the end, he says that 'O Bahu Rahmatu-Allahe Ta-aala Alaihe ! Would that you be killed and slain by the hand of the Beloved and the Mashooq so that there may last no fret of this transitory life on one hand and the responsibility of bloodshed may come on the part of the Beloved for ransom!